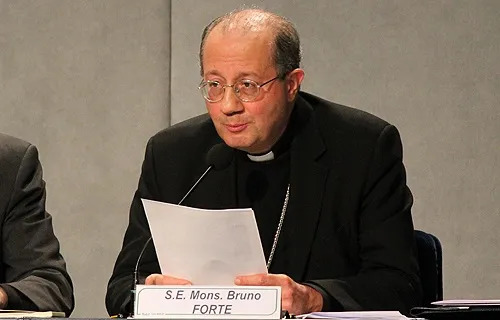 After the debacle of the mid-term report at the Synod, as well as the other upsets along the way, Msgr Bruno Forte, widely credited with the scandalous words in the mid-term Relatio is to be rewarded with another stab at the action in October 2015. Forte retains a highly influential role as Secretary General. His Holiness talks a lot about priests, the Church and scandal. Good to see His Holiness finally taking aim at the powerful gay lobby in the Church. Oh, sorry, that was his predecessor! "Nothing to see here, people. Move along now..."
The Archbishop of Paris, Cardinal André Vingt-Trois. From the Philippines, Luis Antonio Tagle. From Aparecida Brazil, Cardinal Raymundo Damasceno Assis. From Durban, South Africa, Cardinal Wilfrid Fox Napier. The Relator General will be Cardinal Peter Erdo, who serves as the Archbishop of Budapest. The Secretary General, will be Italian Msgr, Bruno Forte. Because the views of Africans are valued in Rome...now...thanks to one Cardinal Walter Kasper. I hope and pray Cardinal Raymond Burke will be outside the venue giving sage and judicious interviews to all-comers even though, sadly, his name isn't down on the list of those invited in the wake of his transfer. We have these months before next October to pray and prepare. Hold tight! It'll be more of the same - promotion of heresy and immorality. We have to be on high alert between now and the next Synod. You can rest assured that the reformers, let's face it, the Relativists, will do everything they can openly and deviously indirectly, to alter Church teaching on divorce abd remarriage and on Holy Communion. Latest news from Vatican: card. Sarah at Congregation of divine worship, card. Ravasi (alas) Culture and catholic education, card. Maradiaga Iustitia et pax + Cor unum + Life academy and Women'rights.....anything else? The worst is yet to come.MHK.